Joseph @The Jersey Devil and I went fossil hunting at an NJ Cretaceous stream on December 22nd and 23rd. On the 22nd I surface hunted, expecting a good wash out due to the previous night's rain. I had secured a section of the stream before realizing that someone had gotten to most of the stream before I had. Instead of continuing forward, I went back and explored some of the sections downstream that I had skipped. These too had been scanned so I ran back to my sifter that I had left upstream and then began sifting. Some hours later I was sifting and saw Joseph. We hadn't expected to see each other but were glad we did. Together we did some sifting and surface hunting before leaving. The next day, I arrived fairly early, hoping that the water had receded enough to expose some gravel bars that I know usually produce well. They were not exposed and I decided to do some water hunting, where I squat down and look in the water for teeth or whatever else I can find. The water was freezing and I was punished each time I went to grab something that was not a fossil. I had said hello to a jogger I saw over the ridge and later my friend Tyler, who does not have an account yet, found me and told me the jogger had mentioned that there was someone else hunting. Hunting on December 23rd has become a tradition between us. For three years now we have both unexpectedly found each other hunting on this day. Tyler did not bring a sifter and, with Joseph soon to be on his way, I asked Joseph to bring a third sifter. When Joseph arrived we all went upstream and began hunting. Not that long into the hunt Joseph found an excellent mosasaur tooth that put me on overdrive trying to find something of equal or greater significance. This did not materialize, but I did end up finding a lot of fossils. 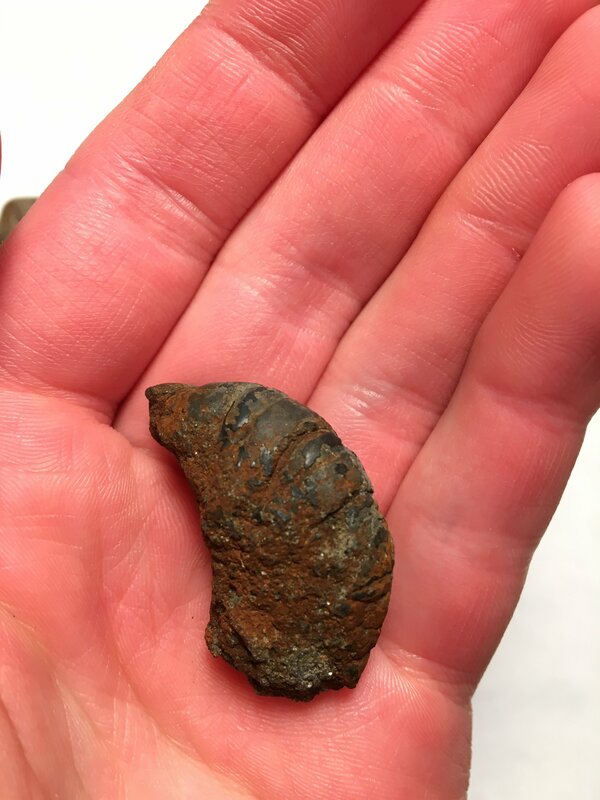 Tyler found an awesome heteromorphic ammonite. Some time later Tyler and Joseph decided to do some surface collecting and Joseph found a killer point. Joseph lent Tyler the point for him to study and replicate; Tyler is an awesome upcoming flint knapper. Together we all had fun and I look forward to future hunts with them. Hopefully we all may be able to go hunting with Dave @Darktooth and Frank @frankh8147 this Friday. That is a great haul Trevor! If I could find 1/4 of that I would be happy. You got lots of nice stuff and great condition. I do hope we can meet up. Originally I was planning on Calvert cliffs but the conditions seem too sketchy for my liking. As I get older I find myself taking less risks. Looks like you scored very well and had a great Xmas Eve hunt. Thank you! Also, better safe than sorry concerning risk taking. Awesome finds! I wish I could've gone down there this break but alas. 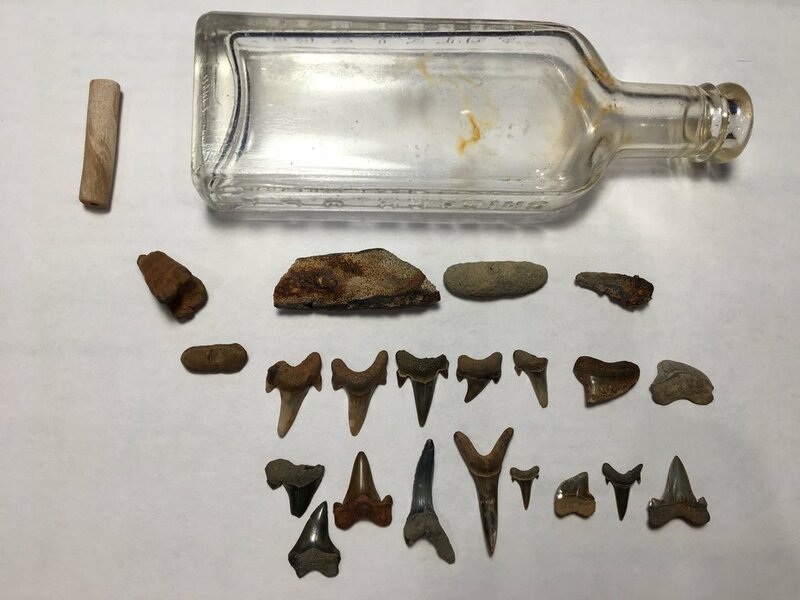 here are my finds minus the arrowhead from our adventures. If anyone knows anything about the bottle (especially it’s age) please let me know. The company is “Foley and Co.,” originating in Chicago. 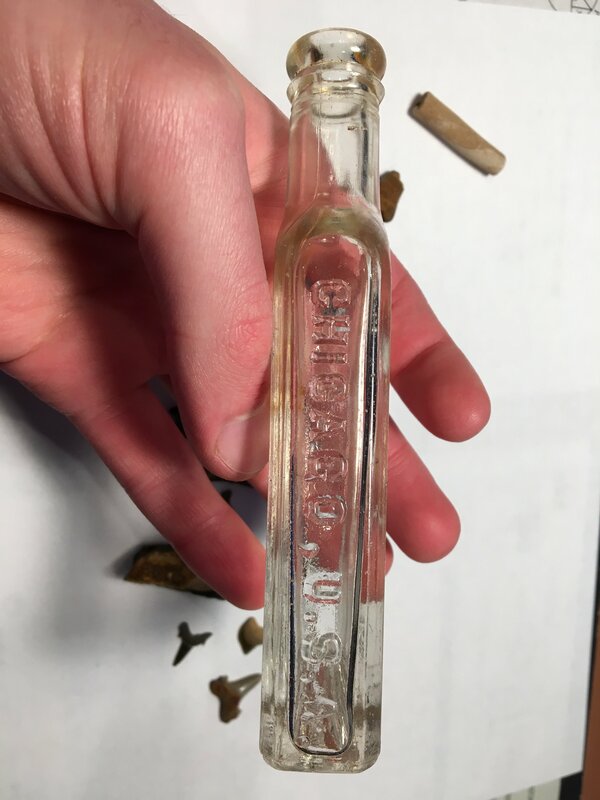 It apparently made medicinal compounds, not booze, and started production in the 1870s. It was hard to find info about the company, but I think it shut down in the early 20th century. 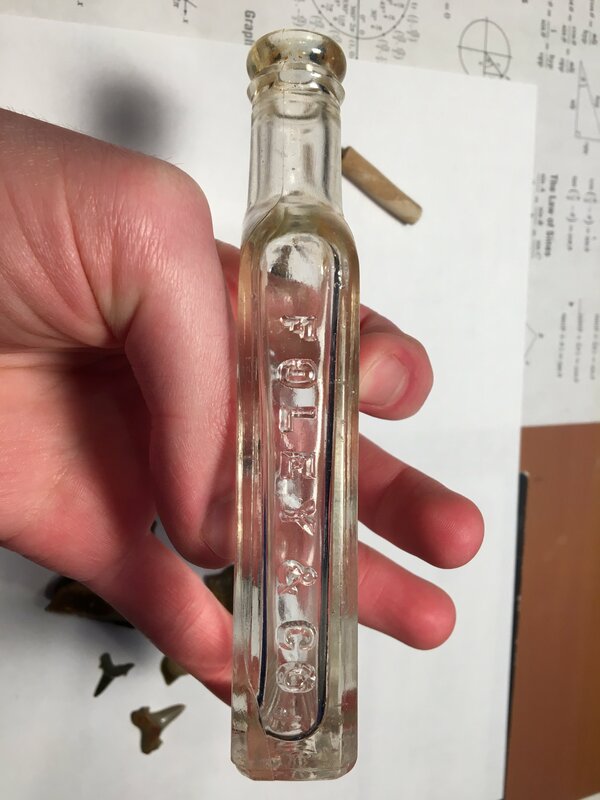 If anyone knows what the age of the pipe stem is please comment as well. 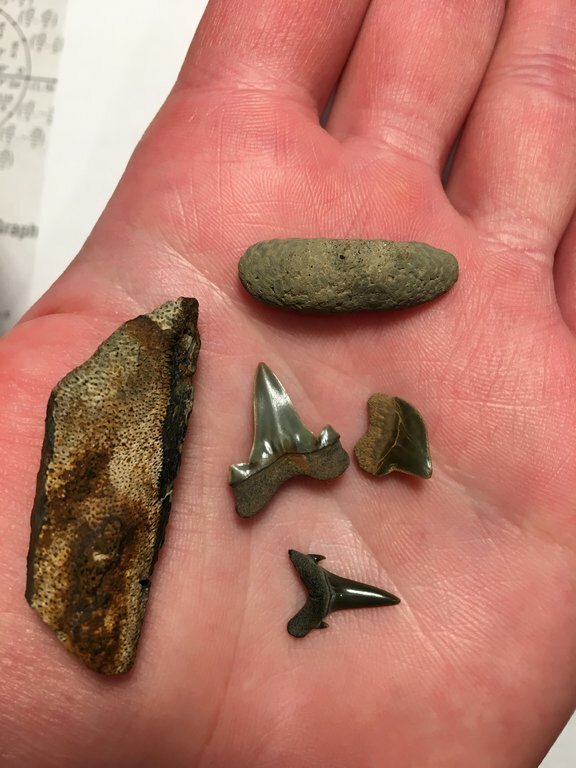 Great finds I love the mosasaur teeth!!! Thanks for sharing! Good job guys! I'd definitely like to see that ammonite Tyler found. Good finds and good friends makes fossil hunting fun! 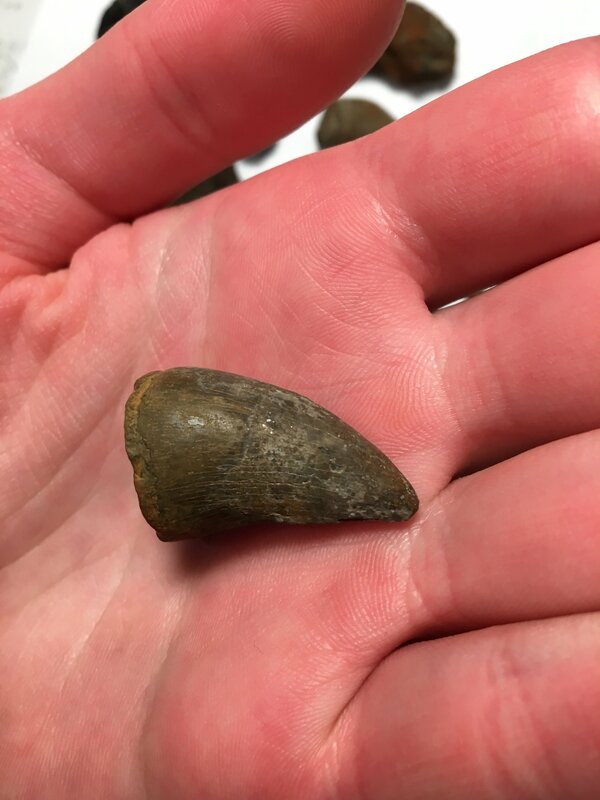 That's a great mosasaur tooth! Congratulations! Thanks! I don’t know if you saw, but I’ve sent you a pm some time ago. Congratulations both you guys. Looks like Christmas came a little early. 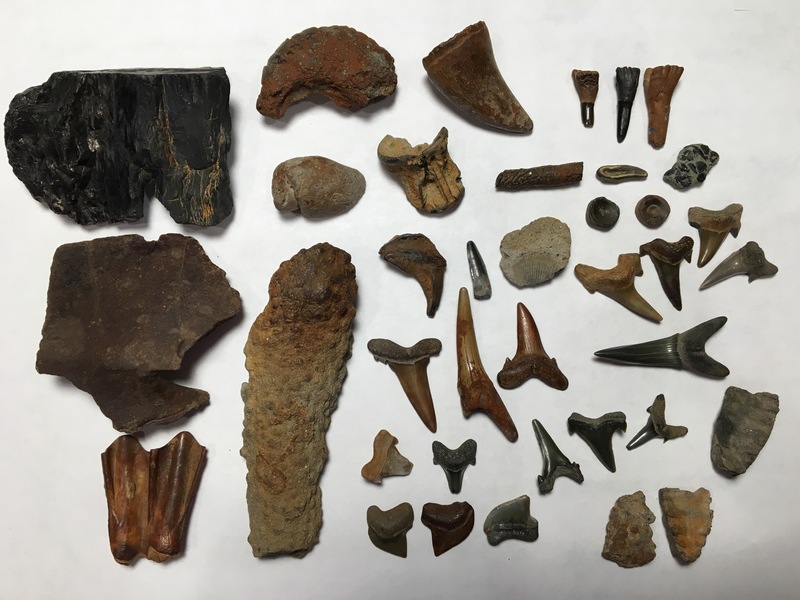 Joseph's mosasaur tooth and lobster are especially magnificent, but there 's a lot of excellent finds in both of your collections. Keep up the good work. Thank you Jeff! 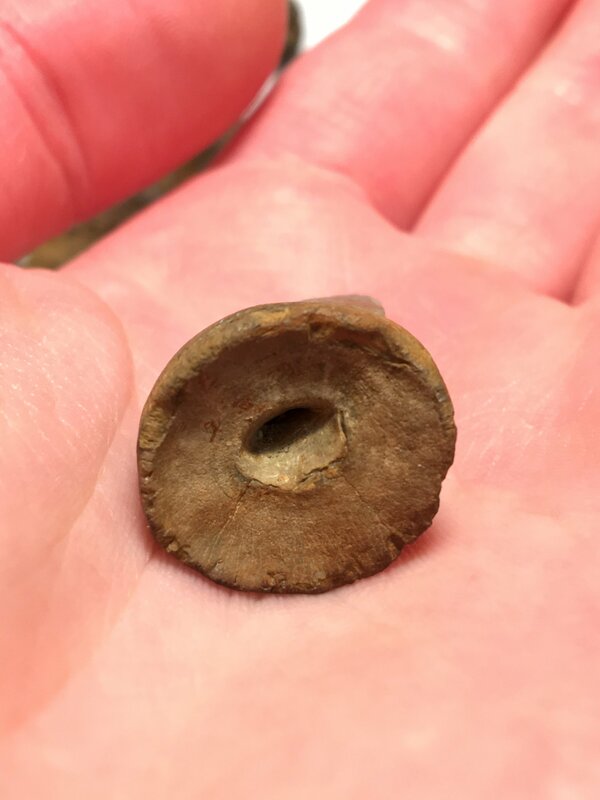 I also found a small Hoploparia; if you look just above the verts, the thing to the left of the small ammonite section and below a crab arm is a lobster. Thanks. I see it now. Would love to get a better view of it and the ghost shrimp claw. Cretaceous deposits of eastern central NJ are grand central for fossil collectors. I don't go anymore because sometimes it's like a traffic jam getting into the stream, people everywhere, church groups, couples, families, little kids running around... etc etc..walking around everywhere with their sifters. it's become a fossil circus. 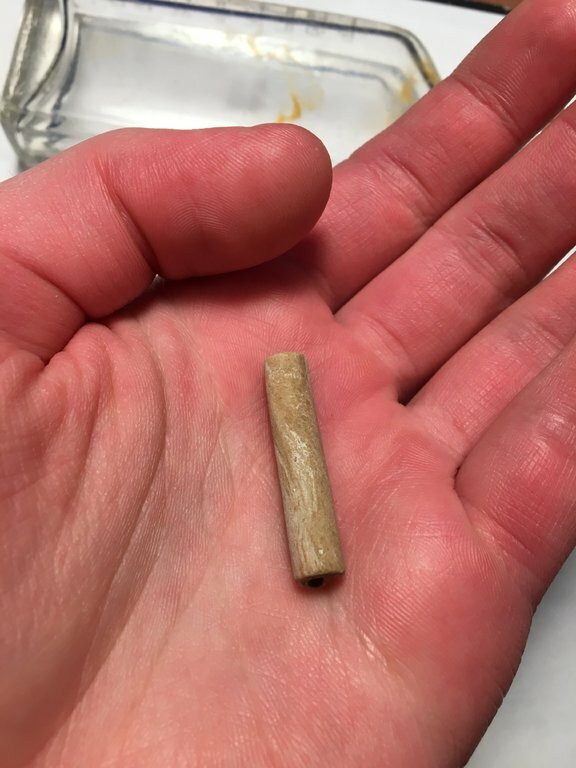 Most finds are tiny sharks teeth others miss. Nice finds!! 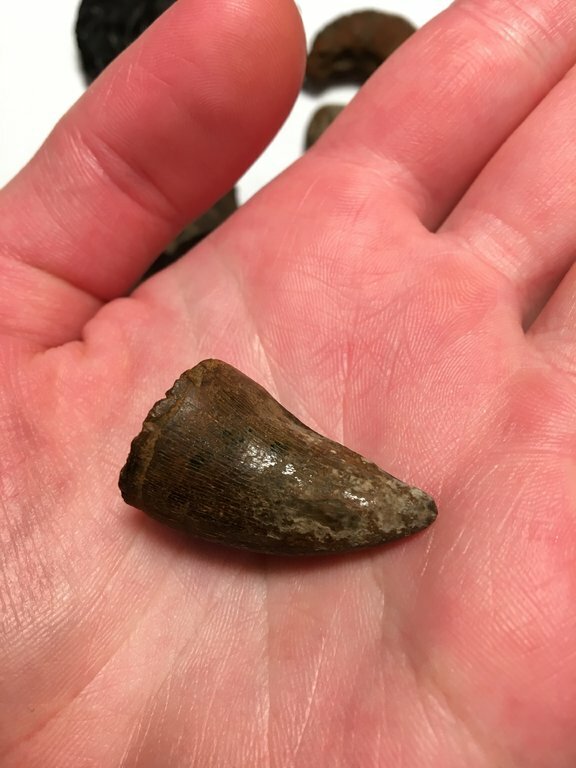 I would probably just label that tooth as Mosasaur (probable Prognathodon) and call it a day. It gets dicey beyond that point. That's a pretty big vert. there too! It does seem that for some reason that everybody is gravitating to sites that produce sharksteeth. Brownies beach gets the same way. It seems other places such as New York Trilo sites I can go many times and never come across another hunter. 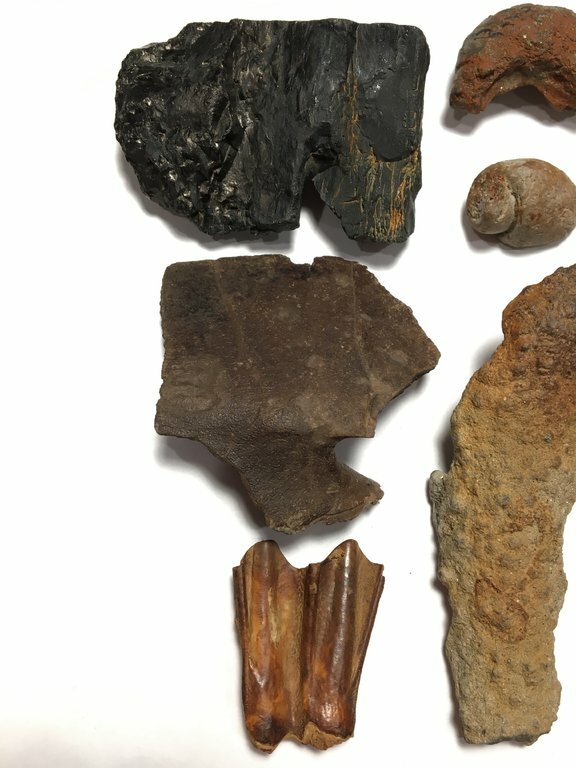 I think places like New Jersey are very appealing to most people because of easy access, kid friendly and there is a good amount of variety in the finds. And I know there are many other reasons. While it does get frustrating with all the competition it is just part of the hunt. After all everybody has the right to enjoy this wonderful pastime. If more people took up this great hobby and tried to connect with Earths past, maybe more would care about Earths future. There are a lot of shark crazed noobs going around but there remain many serene areas to collect in the cretaceous of New Jersey. I cherish the fact that I can collect a whole day and go uninterrupted besides seeing maybe one jogger. Yesterday (not the hunt from this post), I went sifting for 9 hours straight and it was very fun. There was no one there, the temperature was in the mid thirties, and I had an awesome hunt. Sorry you no longer collect, I can understand the strain, but there are still large section of stream that are typically unpacked. 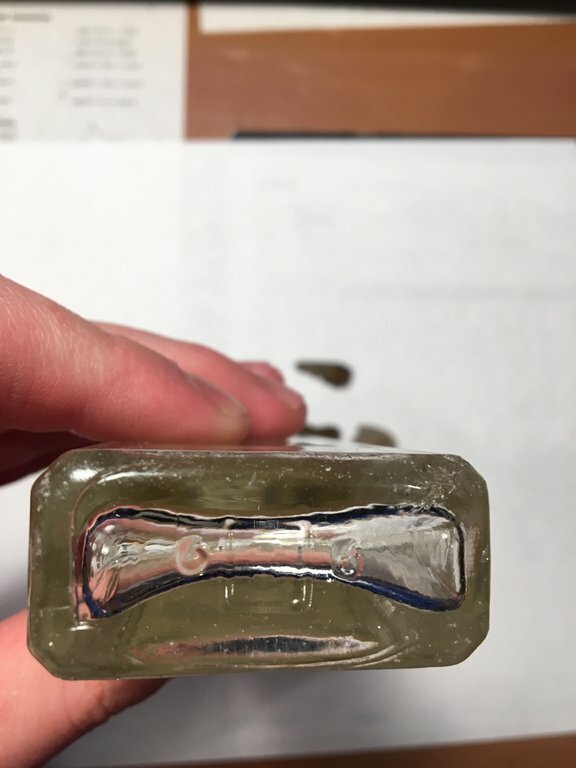 To tell the age of the bottle You need to look at the mold lines - do they run over the lip or stop on the neck of the bottle. Clay pipes have been made for several centuries, so no way to be sure of the age unless it has a makers mark. Looks like it was great trip! Wonderful finds!